What do sapphires, lapis lazuli, Prussian blue and beer bottles have in common? From its use in Chinese axes dating back to around 4000 B.C. to the 563-carat Star of India, the sapphire has been prized both for its hardness and its brilliant blue color. But not all sapphires are blue; the colors we see are the result of impurities and a process called charge transfer. Corundum crystals of gemstone quality in any color other than red are called sapphires, while red varieties are called rubies. These are among the most brilliant and hard gemstones; only diamonds are harder. The intense blue of the sapphire is caused by the addition of titanium and iron to the mineral corundum. 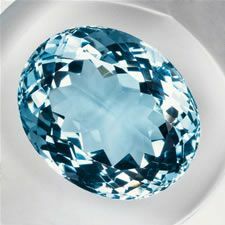 Sapphires are described by their colors (blue, green, and yellow), with the most sought-after color being cornflower blue. The color is very stable, even when exposed to light and heat. Both rubies and sapphires owe their intense colors to impurities, ruby to the presence of chromium, and blue sapphire to both titanium and iron. In rubies, the color can be explained by crystal field theory, but in sapphire, a slightly different process, known as charge transfer, produces the color blue. Although sapphires are found in various parts of the world, not all regions produce the colors that are highly valued. For example, Australia is a dominant producer of sapphires, but these stones are considered less valuable due to their very dark color. 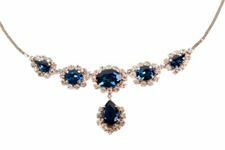 Fine quality sapphires are produced in Southeast Asia, with those from Sri Lanka often having the sought-after cornflower blue color. Corundum contains a repeating unit of aluminum oxide and is colorless. How does charge transfer produce color? Corundum that contains a few hundredths of one percent of titanium is colorless. If a similar amount of iron is present, a very pale yellow color may be seen. If both titanium and iron impurities are present together, however, the result is a magnificent deep-blue color. 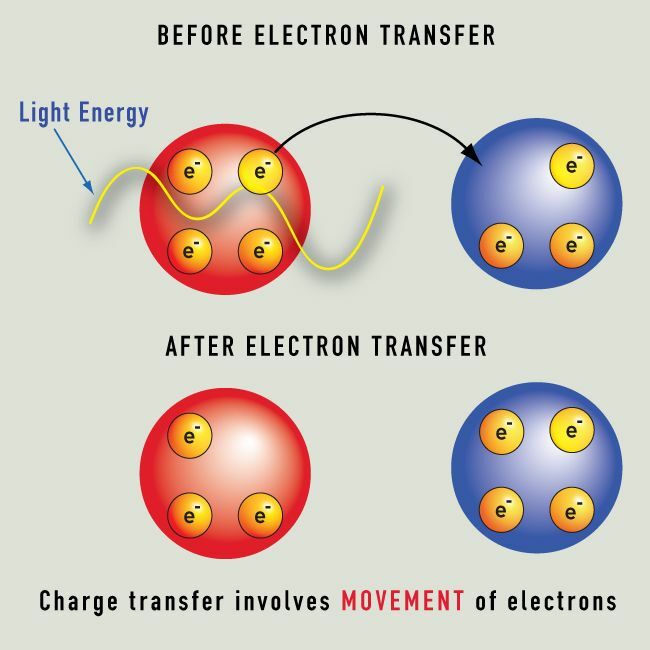 The process at work is called intervalence charge transfer or cooperative charge transfer, which is the transfer of an electron from one transition-metal ion to another. 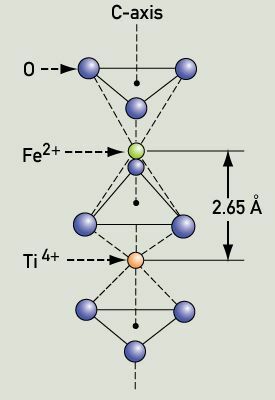 Iron can take the form Fe2+ or Fe3+, while titanium generally takes the form Ti4+. If Fe2+ and Ti4+ ions are substituted for Al3+, localized areas of charge imbalance are created. 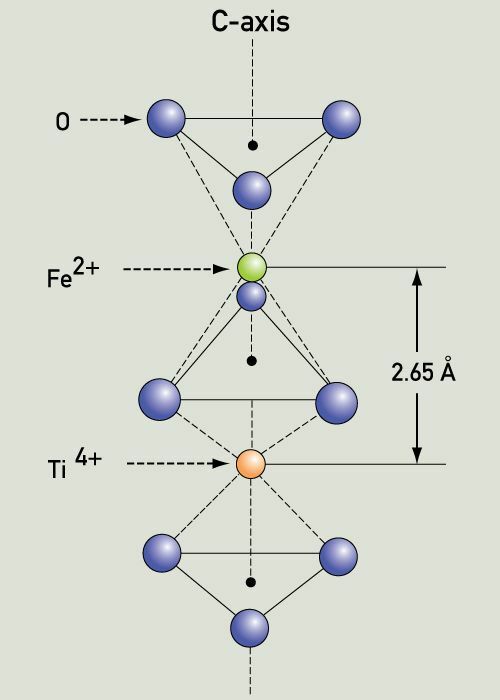 When Fe2+ and Ti4+ ions occupy two adjacent sites in a corundum crystal, the transfer of an electron from the iron cation (positively charged) to the titanium cation (positively charged) can now change the valence state of both. This occurs because there is enough overlap between the outer orbitals of Fe2+ and Ti4+ to allow an electron to pass from one ion to another. This process requires energy. This schematic shows the wavelength of the energy required for the transfer of electrons This schematic shows the wavelength of the energy required for the transfer of electrons from Fe2+ to Ti4+ corresponds to yellow light. When this light is subtracted from incident white light, the complementary color blue results. There can be adjacent pairs in different directions; since the spacing between the atoms is different, so is the energy-level spacing. This leads to blue-green dichroism. Intervalence charge transfer is a process that produces a strong colored appearance at a low percentage of impurity. While at least 1% chromium must be present in corundum before the deep red ruby color is seen, sapphire blue is apparent with the presence of only 0.01% of titanium and iron. This energy jump is comparatively easy for electrons to achieve when light shines on the crystal. Charge-transfer transitions are strong because they are "allowed" by quantum considerations. The "forbidden" transitions in the ligand field-colored ruby are much weaker. Sapphires undergo "heteronuclear" charge transfer as electrons are transferred between ions of different elements. Blue kyanite is colored by the same charge transfer process as blue sapphire. Tourmaline will appear brown when the same impurities, iron and titanium, are present, but appears yellow with the impurities manganese and titanium undergoing charge transfer. 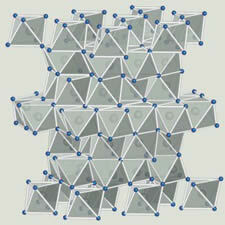 It is sometimes difficult to prove that a specific charge transfer process is responsible for the color of a crystal. Impurities of various kinds may be present at the very low concentrations required for charge transfer to take place, and other factors deriving from ligand field theory, color centers, and so on may make it difficult to isolate the specific source of a perceived color. Examples of minerals under investigation to determine the exact processes causing their colors are tanzanite, magnetite, and andalusite. When the ions belong to the same element, homonuclear charge transfer occurs. A common example is the transformation that occurs in Fe. 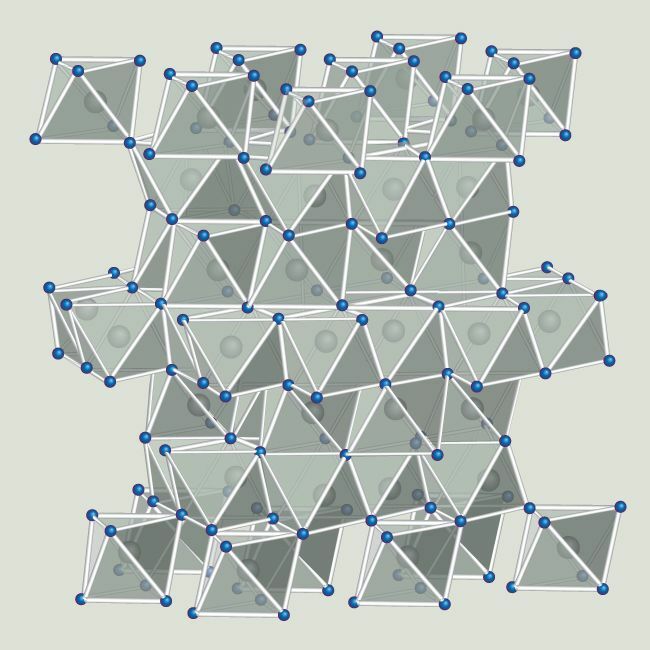 The surrounding environments of the two iron ions have to be different. This charge-transfer process between the ferrous and ferric forms of iron, present as impurities in different solid environments, is a ready source of color. 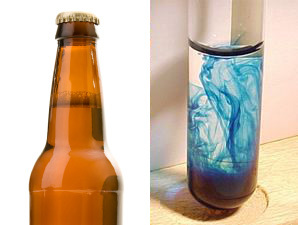 It makes glass bottles brown, it makes sandstone brown (often seen in brownstone buildings), and it is the source of the blue in the pigment Prussian Blue Fe4(Fe(CN)6). Blue aquamarine. Beryls containing chromium impurities appear green and are known as emeralds. This is attributed to ligand field effects. However, the presence of iron impurities in beryl produces the color of aquamarines. The mechanism of charge transfer between two different ionic forms of iron give aquamarine its characteristic greenish-blue color. Charge transfer is also responsible for the colors of a number of pigments. Substances that display their colors even when ground very finely are good candidates for pigments. The charge transfer process occurs both in whole crystals and their powdered forms, making these substances ideal pigments. 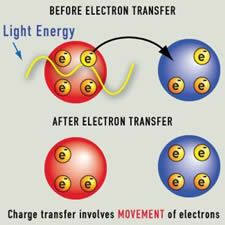 In this case, the charge transfer process occurs between metal and ligand atoms. An example is the oxygen-to-chromium charge transfer in yellow chromate K2CrO4. This K2CrO4 contains the CrO42- anion (negatively charged). The effect of ligand fields can be ignored, as there are no unpaired electrons in the chromium (present as a Cr6+ cation). The chromium cation will have a strong attraction for electrons from the oxygen anions, allowing a ligand-to-metal (anion to cation) electron transfer. Other examples of this are the orange dichromate (K2Cr2O7), permanganate salts, and chrome yellow (PbCrO4). This mechanism is also present in sapphires, but absorption occurs only in the ultraviolet range, and does not affect the color we perceive. It turns out that many colored pigments, including red and yellow ochre that occur naturally (used by the cave artists of the Ice Age, by Michelangelo on the Sistine Chapel ceiling, and by artists today), achieve their characteristic colors through the process of charge transfer. Ultramarine (left) achieves its brilliant color through the process of charge transfer. Ultramarine was used by the ancient Egyptians, the French Impressionists, and is still in use today. The deep blue gemstone lapis lazuli (right) has the same composition as the pigment ultramarine, approximately CaNa7Al6Si6O24S3SO4. This is an example of anion-anion charge transfer, where the color stems from charge transfer between the three sulfur anions.